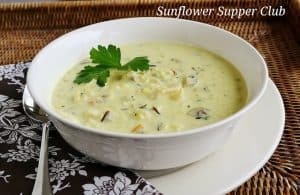 I have been under the weather this week and when I don’t feel well, a creamy bowl of soup is the perfect comfort food. Also, the weather here in Kansas finally turned colder so a pot of this soup just sounded ideal. We even got a light dusting of snow this week! It was a pretty snow, and the best part was it melted off the roads as it was falling, so just the trees and yards were covered. 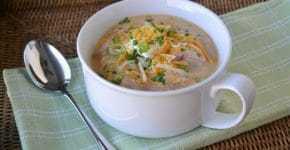 I have a recipe for Chicken and Wild rice soup that I found a while back on the internet. It uses a box of Uncle Ben’s rice and wild rice blend with the seasoning packet. It is a wonderful recipe, but chalk full of sodium, chemicals, and preservatives. Since in the New Year we are trying to eliminate processed foods, I decided to come up with a new Chicken and Wild Rice Soup recipe. I still used the Uncle Ben’s blend of long grain and wild rice for ease because I had one on hand. You could certainly cook some long grain and wild rice if you wanted to. You want to end up with about 1 cup of cooked white rice and ½ cup cooked wild rice. Also, I used the spice turmeric, which is similar to curry, in this soup. I love the flavor that this spice gives a dish, but if you are not so sure, you might start with just a ¼ teaspoon and see if that is enough for your taste. You’ll see once again I added Frank’s Hot Sauce to my recipe. I think I should be getting some kickback from them! I literally add Frank’s to just about everything. We finally broke down and bought a gallon of the stuff at Sam’s Club, and I can’t believe how much we have already used. It is not so hot that it is too spicy — it just gives a really nice bite. Cook the Uncle Ben’s rice in two cups of chicken broth, omitting the butter and the seasoning packet per package directions. Meanwhile, melt butter over medium heat in a Dutch Oven or large soup pot. Add mushrooms, onion, celery, carrot, garlic, salt and pepper. Cook vegetables for about 10 to 12 minutes until mushrooms have released their liquid and vegetables are soft. Add the ½ cup flour and stir for about 2 minutes. Slowly add the remaining 5 cups of chicken broth a little at a time. Add the turmeric, cumin, thyme, tarragon and Frank’s Hot Sauce. Bring the mixture to a boil and then reduce heat and simmer about 15 minutes, stirring frequently. Stir in the cooked Uncle Ben’s rice, the cooked chicken, ½ and ½, fresh parsley, white wine, lemon juice. Cook over low heat, stirring often, for about 5 minutes until thoroughly heated. I linked this recipe up over at the Weekend Potluck hosted by 4 Little Fergusons, Meet Penny, Baking Bad, and The Country Cook. Check it out for tons of delicious recipes!